This is my family's favorite restaurant. The service and food quality is always excellent. There are not many of these but you are lucky enough to have one if you live in the following cities. They too have an e-club. So far, I have received a coupon in my email for a free appetizer. Their appetizers are big enough to be a meal ! Go here to sign up. Choose your location and Click on Join The Dreaming Club Today. They are also having Well Drinks from the bar for $1.99 each for the entire year at the Duluth location ! Nope that's not a typo - this deal LASTS ALL YEAR LONG. Gymboree - save up to 70% now. Free shipping when your purchase is $100 or more. Go here. Restoration Hardware - save up to 65% now. Go here. Plow and Hearth Spring Clearance - save as much as 65%. Go here. Shutterfly has a free photo book available - 20 pages, 8x8 - valued at $29.99. Simply use the coupon code - PHOTOBOOKS when you check out. Office Depot has lowered their prices on many of their best sellers ! Go here for a complete list. New Shortcuts e-coupons are now available for loading to your Kroger card. There are some Huggies one !! 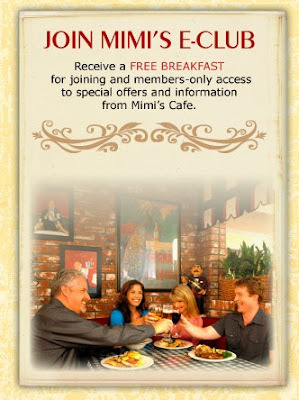 Join the Mimi's Cafe E-club and get a $5 off $15 Breakfast check coupon in your email for starters. Go here to join. Many restaurants have these type clubs these days so stay tuned as I'll highlight one a day. Time to Refill the Gift Closet? Take up to 70% off toys at Amazon! Get hot toy deals!